everyone goes to sleep . . .
except for the watchful owl! With a spare, soothing text and beautifully rich and textured illustrations of a starry night, this is the perfect “book of sleep.” Join the owl on his moonlit journey as he watches all the other animals settle in for the night: some sleep standing up, while some sleep on the move! Some sleep peacefully alone, while others sleep all together, huddled close. Il Sung Na makes his American debut with this gorgeous bedtime offering. While each animal rests in its own special way, little ones will also drift off to a cozy sleep. Originally from Korea, IL SUNG NA studied illustration at Kingston University in London. 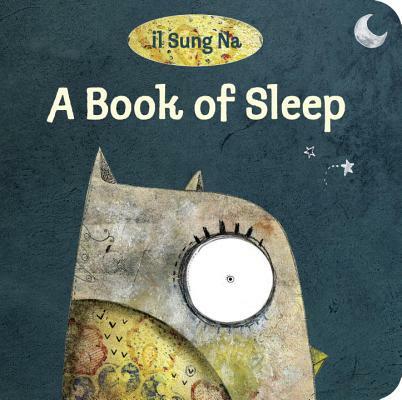 A Book of Sleep was his first picture book, followed by The Thingamabob and Snow Rabbit, Spring Rabbit (Spring 2011), which are also available from Knopf. To learn more about Il Sung Na and his work, please visit IlSungNa.com. "Na’s wonderfully illustrated debut is one of those bedtime books that children will likely turn to again and again." "It's the rare picture book that, upon arrival, feels as though it has been around for years already"
"Nimble lines influence the gentle mood through spotted colors and shaded images, balancing darkness and light to depict the passing of time."